There are possibly only two classes of ‘particles’ in the universe – Fermions and Bosons. All elementary particles (Quarks, Leptons, Guage Bosons, Static Bosons etc.) will fall under either of these two. Not only elementary particles, but also composite particles like Baryons (Eg: Protons, Neutrons etc.) will also fall under this basic classification of all particles into Fermions and Bosons. The scheme of Quantum Field Theory is that Fermions interact by exchanging Bosons. All fermions have half-integer multiple spins (ie 1/2, 3/2, 5/2…). Fermions are subject to Pauli Exclusion Principle which states that no particle can exist in the same state in the same place at the same time. Thus Fermions are solitary. Only one Fermion may occupy any quantum state – the Fermionic solitariness of electrons is responsible for the structure of molecular matter (in fact for all ‘structure’ in the universe). The degeneracy pressure that stabilizes white dwarf and neutron stars is a result of fermions resisting further compression towards each other. Fermions obey Fermi–Dirac statistics. Fermions are usually associated with matter while Bosons are the force carriers. NB : The difference between quarks and leptons is that quarks have a color charge (and therefore interact with the strong force) and leptons do not. This means that gluons will react with quarks but not with leptons. NB: Quarks are always accompanied by gluons, and are always in sets where their total color charge equals zero. Quarks are what make up the composite particles like hadrons (heavy) and mesons (medium). All bosons have either zero spin or an even integer spin. Bosons are gregarious. Bosons may occupy the exact same quantum state as other bosons, as for example in the case of laser light which is formed of coherent, overlapping photons. In fact, the more bosons there are in a state the more likely that another boson will join that state (Bose condensation). Fermions are usually associated with matter while Bosons are the force carriers. Examples of bosons include fundamental particles such as photons, gluons, and W and Z bosons (the four force-carrying gauge bosons of the Standard Model), the Higgs boson, and the still-theoretical graviton of quantum gravity; composite particles (e.g. mesons and stable nuclei of even mass number such as deuterium (with one proton and one neutron, mass number = 2), helium-4, or lead-208); and some quasiparticles (e.g. Cooper pairs, plasmons, and phonons). NB: The name boson was coined by Paul Dirac to commemorate the contribution of the Indian physicist Satyendra Nath Bose in developing, with Einstein, Bose–Einstein statistics—which theorizes the characteristics of elementary particles. NB: The graviton (G) is a hypothetical elementary particle not incorporated in the Standard Model. If it exists, a graviton must be a boson, and could conceivably be a gauge boson. (Elementary Boson). Update – scientists recently discovered Gravitational waves. NB: Composite bosons are important in superfluidity and other applications of Bose–Einstein condensates. The electrons belong to the class of elementary particles called leptons. 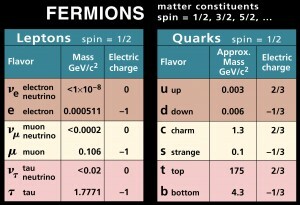 The leptons and quarks together constitute the class called fermions. According to the Standard Model all mass consists of fermions. Whether the fermions combine to form a table, a star, a human body, a flower or do not combine at all depend on the elementary forces – the electromagnetic, the gravitational, the weak and the strong forces. According to the Standard Model all force is mediated by exchange of (gauge) bosons. The electromagnetic force is mediated by exchange of photons, the strong force by exchange of gluons while the weak force is mediated by exchange of W and Z bosons. Mesons are intermediate mass particles which are made up of a quark-antiquark pair. They are bosons. 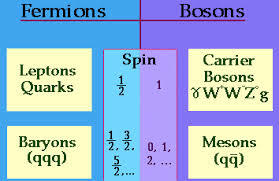 Three quark combinations are called baryons. Baryons are fermions, ie they have spins like 1/2, 3/2 etc. 1 quark + 1 anti quark = Mesons. 5 quarks = Penta quarks.